Joyita - 1955 "Mary Celeste of the South Pacific"
Not all mysteries are on sailing craft and way back in the day. 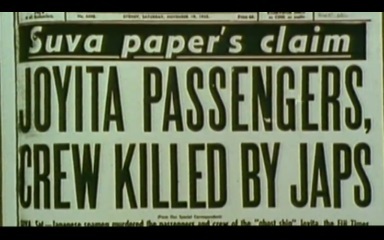 03 October 1955 is the date for this mystery of the sea. She was named for actress Jewel Carmenille . Joyita is Spanish for " little Jewel". She was sold in 1936 to another private owner who made frequent trips up and down the coast between LA and Mexico. ​ She was acquired by the Navy in October 1941, and was rechristened YP-108 and patrolled the harbor at Pearl Harbor during the infamous attack there in December of that year. After the war she was sold as surplus in 1946 . Her new owners added 2 inches of cork to here hull, and refrigerated cargo spaces. By the 1950’s she was being used as a charter fishing vessel and small cargo vessel in the Copra trade. ​She left Samoa on that fateful October day in 1955 at about 5 am. Captain Miller at the helm. She had 25 souls on-board counting crew and passengers. She was sailing on this tide instead of the prior day due to a port engine clutch failure. She left port on one engine bound for the Tokelau Islands. This journey of 270 miles was to take about two days. On October 6 she was reported overdue. There was not much concern, as no distress signal was reported in the area. However a search and rescue mission was started which was to last until the 12th of October. Even with covering 100,000 square miles of ocean, no sign of the Joyita or any of her passengers or crew was found. The search was called off. November 10 the merchant ship Tuvalu sighted the Joyita. She was more than 600 miles west from her scheduled route. She was drifting, partially submerged, and listing heavily to port. There was no trace of any of the passengers or crew, and 4 tons of her cargo of medical supplies were also missing. The ships boat and three life rafts were missing, along with her logbook, and the crew. There was damage to her superstructure with her flying bridge smashed away and the windows of her deckhouse broken. There was also a tarp rigged behind the bridge to act as a shelter. Barnacle growth above the normal waterline on the port side suggested the list had been on the ship for a while. ​ She was towed to port, and an inquest was performed. She was determined to be in a poor state of repair, however the fate of the passengers on-board was determined to be "inexplicable on the evidence submitted at the inquiry". She was extremely buoyant and was not in major danger of sinking, in spite of her list. Overall, she was in a bad state of repair, however due to the cork additions and the partial cargo of empty 55 gallon oil drums, she was in no immediate danger of sinking. There was still fuel in Joyita's tanks; from the amount used, it was calculated she made some 243 miles before she was abandoned, probably within 50 miles of Tokelau. The leak had probably started after 9 p.m. on the second night of the voyage, with nine hours of darkness ahead. The electric clocks on board had stopped at 10:25 and the switches for the cabin lighting and navigation lights were on, implying that whatever had occurred happened at night. The ships' logbook, sextant, mechanical chronometer and other navigational equipment, as well as the firearms Miller kept in the boat, were missing. The recovery party noted that the radio was discovered tuned to 2182 kHz, the international marine radiotelephone distress channel. A break was found in the antenna cable, which would have limited the effective range of the distress calls to about 2 miles. The cable had been painted over, obscuring the break. A doctor's bag was found on deck, containing a stethoscope, a scalpel, and four lengths of blood-stained bandages. She did not carry life-jackets for everyone on board. She had a ships boat and 3 rescue life rafts that were apparently deployed. Her logbook, navigation equipment were all removed. The starboard engine was found to be covered by mattresses, while the port engine's clutch was still partially disassembled, showing that the vessel was still running on only one engine. Her hull was found to be sound. They found the water came into the lower decks via a pipe in the raw water circuit of the cooling system. The pipe had corroded due to galvanic action, allowing water into the engine spaces. The bilge pumps had no strainers, and had likely clogged with debris, not allowing the water to be pumped out to discover the source of the leak during the event. An auxiliary pump had been rigged in the engine room, however, it had not been connected. The board was unable to figure out why an experienced captain would leave a larger ship, in no danger of sinking, to put themselves at the mercy of the elements in small rafts and craft. Although Miller was aware of the buoyancy, the rest of the crew and passengers may not have been. Had Miller been incapacitated for some reason panic may have set in among the passengers who may have taken to the life rafts. The presence of blood stained bandages on deck point to some injuries had occurred. One of the passengers was a surgeon, so he would make sure the captain was cared for and loaded into one of the small craft. Of course they would not have taken all the navigation equipment or 4 tons of cargo with them in this scenario. The local newspaper Fiji Times and Herald had an impeccable source that stated the Joyita had passed through a fleet of Japanese fishing boats during its trip. The source also stated the Joyita "had observed something the Japanese did not want them to see." This theory seemed to gain some evidence when knives stamped “made in Japan” were found by the salvage crews rehabbing the ship. However test determined the knives were most likely used onboard in the late 1940’s during fishing operations. So close to WWII there was a strong anti-Japanese feeling in the region. This latent dislike was amplified by permission being given to the Japanese to operate their fishing fleets in the surrounding waters. It was also seemingly credible that forced active from WWII were still operation from a nearby hidden base, as reported by another local paper. There was also speculation the vessel's occupants were kidnapped by a Soviet submarine. This was the height of the cold war, and theories like that seemed plausible at the time. Any and all mysterious happenings at sea always can be attributed to modern day pirate action. The supposition is pirates attacked the vessel. They killed the 25 passengers and crew and cast their bodies into the ocean. They then stole the missing four tons of cargo. The captain and owner Miller had amassed large debts. He had a series of unsuccessful fishing trips recently and was behind on his bills. However, no seacocks were found open to scuttle the ship. Not counting the captain knew the ship would be almost impossible to scuttle due to it’s construction and added cork. It came to light that Joyita was to be chartered for regular runs between Samoa and Tokelau by the government. These government charters would have quickly cleared his debts. In 1962, a travel writer published a book stating that there was a mutiny on-board. Maugham concurred that events started with flooding by the cooling pipes. At the same time increasingly heavy swells, the darkness of night, and squally weather buffeted the ship. Captain Miller would have pressed on, hoping to reach port knowing he was close. There was apparently bad blood between him and his first mate Simpson. The supposition was Simpson and some of the crew demanded he turn back. At some point the captain was incapacitated, and possibly Simpson as well. The lack of working bilge pumps and increasing weather would have eventually caused the starboard engine to fail at about 10pm, and plunged the ship into darkness. The confusion added to the increasing listing may have caused the remaining passengers to panic causing them to abandon ship. The seemingly insane action of leaving a still floating ship in a storm to board small rafts was explained by they had sighted a nearby island and reef and tried to reach it. They were unable to make landfall due to the winds and currents in the storm. The damage was caused to the superstructure was caused afterwards by waves while the ship drifted. ​ No matter which theory seems credible, of the 25 souls, no record was ever found. As of 2012 they were still on the missing list. The answer may never be found out. There were reported sightings of Captain Miller around the Pacific Rim, but each one of those have been apparently false. Of the ship, she was resold at auction in 1956, and passed through a series of owners, but misfortune followed in her wake. After a series of groundings she became known as an unlucky ship and was abandoned on a beach in the early 1960’s. She was bought and plans were in the works to turn her into a floating museum and tourist attraction, however those plans never materialized. She slowly succumbed to wind and tide till there was almost nothing left in the late 1970’s.